A federal judge today sentenced Jose Adan "Chucky" Martinez Castro to 19 1/2 years in federal prison for a racketeering charge related to his role in overseeing MS-13 gangs along the East Coast - including a December, 2015 gang conference at his Virginia house at which he ordered members to increase their attacks on the rival 18th Street Gang. Read more. A federal jury today convicted Edwin "Sangriento" Gonzalez, 22, for helping to murder Wilson Martinez, 15, in September, 2015, and Cristofer Perez de la Cruz, 16, in January, 2016. Jose "Little Crazy" Vasquez today pleaded guilty to a RICO charge for his role in trying to hide evidence of the murder of Cristofer Perez de la Cruz, 16, of Chelsea on Falcon Street in East Boston in January, 2016. He faces up to 18 years in prison at his Aug. 30 sentencing. A Salvadoran national living in East Boston admitted in federal court yesterday that, as a national MS-13 leader, he ordered the deaths of Wilson Martinez, 15, and Cristofer Perez de la Cruz, 16. Boston.com reports on a court transcript related to the death of Cristofer Perez de la Cruz, 16, whom local MS-13 members allegedly found in the central Mass. area where he'd been relocated by police after he agreed to testify against MS-13 members, then killed him and dumped his body on Falcon Street in East Boston. The 64-page federal indictment against alleged local members of the murdering, drug-running MS-13 provides some details on the gang-war murders of three teenagers in East Boston between September and January: Two were killed by gang members looking for promotions by proving they could murder somebody while the third died because gang leaders had decided at a meeting to step up its wars with rivals across the eastern US. Read more. Boston Police today identified Sunday's murder victim as Cristofer Perez de la Cruz, 16. He was from Chelsea. He was found fatally shot around 1:35 a.m. on Falcon Street. Read more. 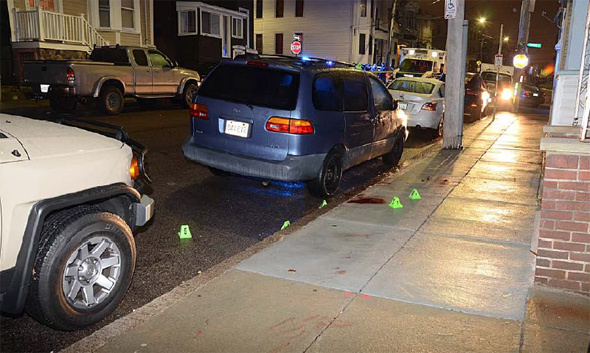 Boston Police report a man was fatally shot around 1:35 a.m. at 144 Falcon St.. He is Boston's first homicide victim of 2016.